Ile-Ife is definitely going to have an invasion of celebrities as more artistes and comedians are getting on the train of Ile-Ife Fiesta, and it's looking like an awesome event already. the tungba exponent; Yinka Adonai, the king of horns and trumpets; Goke Bajowa, the juju act called Soji Best (Mr. Solace), the Chinese pastor and Comedian; Pastor Chinko‎, the fast rising Juju act; Prince Olu Sam, the non-assuming STYLO, the teenage rap king; Lil P, Baba Ajobiewe; the eulogy king, the oloshirigi chant group, the funny Thompson Lawyer, the Ile-Ife kegites club and a host of others. "we are elated to have various artistes call us up that they wanna be a part of our event. You can imagine how our after party is gonna look like. We got a call from a cultural group from South Africa, but we felt logistics maybe an issue, considering the timing of the event. We are really grateful that our platform is this acceptable already, and we promise Nigerians to expect the best in Ile-Ife come the 28th of this month". 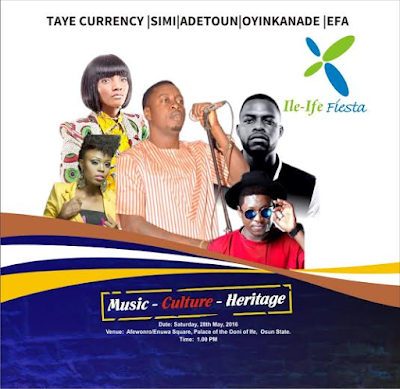 Ile-Ife Fiesta is aimed at showcasing the rich potentials of the kingdom, to ultimately attract both local and foreign direct investment into the City. The Gold and other mineral resources are just waiting for the world to come and explore, and the Alayeluwa, His Imperial Majesty, Ooni Adeyeye Enitan Ogunwusi, OJAJA II, Ooni of Ife would be delighted to play host to such investors.